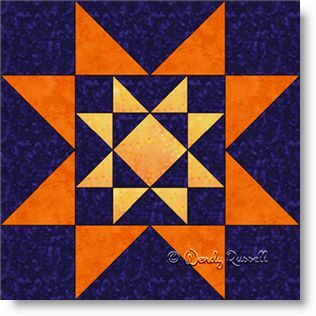 The Double Star #2 quilt block is, as you might have guessed, based on the Double Star block. The difference is slight, but does add some extra interest -- the centre of the complete quilt block has a square in a square patch, rather than a single square. This quilt block also features several different common patches, including flying geese units as well as half square triangles and also quarter square triangles, all in two different sizes. So, in fact, you are actually creating a small quilt block inside a larger block. By paying close attention to your quarter inch seam allowance, you will have no difficulty in sewing this block. And, look how different your quilt can look, just by the setting you choose for your quilt blocks.